€29.95 EURO PRICE By Dr. David Duke, incorporating the writings of Aleksandr Solzhenitsyn, Frank Britton and others. This is the single most important work on the ethnic origins of the Russian Revolution and the greatest Holocaust in the history of mankind: Soviet Communism and its tentacles which spread out all over the world. It is estimated that more than 30 million—and perhaps untold millions more—died in the Holocaust which Communism created. From the millions who suffered in the Gulags through to the Ukrainian Holodomor—which is still the single greatest genocide in all history—the blood-stained hands of Communism and its creators brought untold misery and deprivation to nearly half the world’s population. 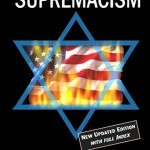 This book rips aside the curtain which has been placed to cover up the single, dedicated, fanatic and murderous ethnic group which founded and controlled this “worldwide conspiracy for the overthrow of civilization” (as Churchill called it): Jewish Supremacists. 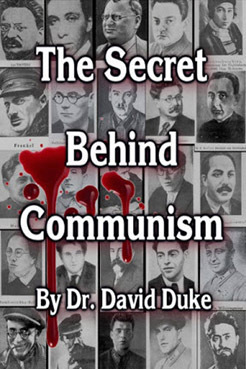 Read of how Jewish Supremacists created and guided the Communist movement, from its germination, to the “Russian” Revolution, the seizure of Eastern Europe, its tentacles in America and Britain, South Africa and even in early Communist China. More of my countrymen suffered horrific crimes at their blood-stained hands than any people or nation ever suffered in the entirety of human history. It cannot be overstated. Bolshevism committed the greatest human slaughter of all time. 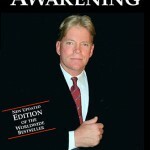 This book is unique in that it brings all of the most powerful historical evidence together in one unified coherent work. It even has key translations from Solzhenitsyn’s book Two Hundred Years Together, a book that has been kept from the English-speaking world. 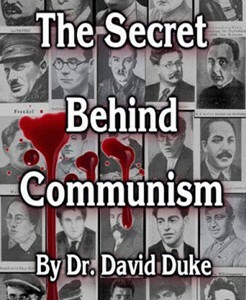 It also has startling revelations from Jewish historians and Jewish writers admitting their leading role in communism, their role in the mass murders, and it shows the ethnic racism that motivated the ethnic genocides against non-Jewish peoples. Perhaps even more importantly the book shows how both Zionism and Communism ultimately come from the same source and how among the worldwide Jewish community, communism has been subsumed into Zionism. In the European world, Jewish tribalists are today orchestrating a genocide of their racial enemies, only in different form than that of Soviet Bolshevism. 288 Pages, hardcover, dust jacket.